We detail current investment solutions, and identify their strengths and pitfalls. 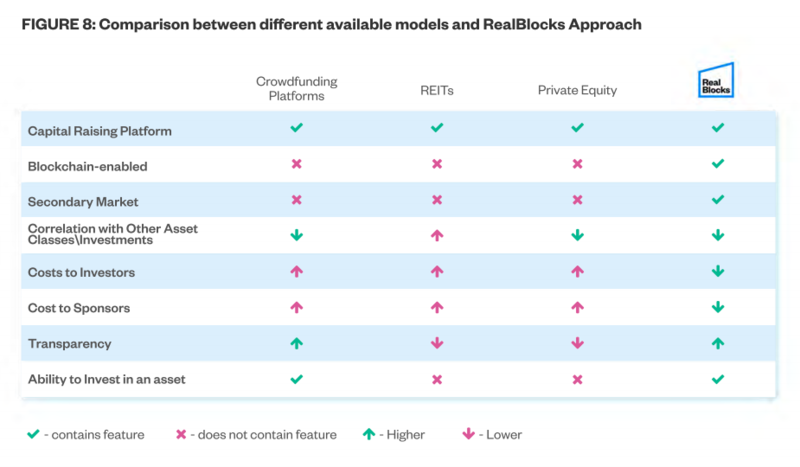 See how RealBlocks improves on what is currently available in the market. The primary disadvantage of the REITs comes from the fact that they are listed on the stock exchange. Therefore, their prices have some of the systematic risk associated with the broader stock market. While many individuals aim to diversify their portfolios through real estate investment, the correlation between the performance of the stock market and REITs reduces the diversification effects for an investor’s portfolio. Moreover, an investor investing in REIT stock has no control on investment decisions. Further, as REITs are classified as a pass-through entity of real estate properties, their dividends are taxed at an ordinary income tax rate. Private Equity funds typically require a property/asset manager or a general partner, which introduces an additional layer of costs for the investors. The private market is characterized by an uneven distribution of information, individual asset characteristics, high barriers to entry (high investment minimums) and a significant role played by the agents and evaluators. As a result, private real estate markets are considered largely illiquid. While crowdfunding platforms have certainly made their mark on the real estate industry, they’re ultimately a product of legislative change (JOBS Act) rather than technological innovation. Ultimately, there has not been any paradigm shift in investment transparency, liquidity, payment fees and the security of the organization. In other words, the improvement in the marketplace has been more of an incremental one rather than a fundamental one. Stay up to date on what we’re doing and sign up for our newsletter here! Join the conversation on Telegram, Twitter, and Reddit!